The dates for Indian Prime Minister Narendra Modi’s visit to Japan have finally been set, after an aborted attempt in early June when he was forced to stay behind to oversee the implementation of his new BJP lead government’s budget. The Ministry of External Affairs announced that Modi will visit from August 31 to September 3, and will meet with Prime Minister Shinzo Abe while there. As my colleague Ankit has pointed out, there is much to be discussed between the two sides. While Modi’s visit has been delayed, he is likely eager to discuss increased trade ties, investment (particularly in energy), and deals to import Japanese military hardware. Modi has been intent on visiting Japan since taking office, and despite already visiting Nepal, Bhutan, and Brazil first, this will likely be one of the most significant visits of his early administration. Japan recognizes the opportunity presented as well, as Chief Cabinet Secretary Yoshihide Suga said “Through this opportunity, Japan hopes to further strengthen its strategic global partnership with India.” Abe and Modi are expected to hold a summit on September 1, and Suga said bilateral cooperation will be their main focus, particularly in economic affairs, politics, security and personnel exchanges. Two specific items that have been mentioned so far for discussion are the pending export of the Japanese manufactured ShinMaywa US-2 amphibious patrol aircraft and a bilateral deal allowing Japanese companies to build nuclear power plants in India. These two deals highlight the nature of the bilateral relationship, and how both leaders see such a relationship strengthening not only their economic performance, but also their strategic position in the Indo-Pacific region. The nuclear deal would be an obvious gain for both countries. India aims to have nuclear energy comprise 25 percent of all electricity by 2050, and so Japan’s long history of nuclear power production is a natural fit. At the same time, Japan’s nuclear industry must find viable new markets to expand into in order to survive, now that the future of nuclear energy in Japan remains uncertain, and in all likelihood will not return to its previous dominance in the domestic energy mix. The deal to trade in military hardware is indicative of the changing security calculus in the region, and the relationship both leaders hope to forge. India is the largest arms importer in the world by a significant margin, and now that Japan has loosened its restrictions on arms exports it is interested in filling some of that demand. While much has been made of the nationalist leanings of both leaders, they do have a vested interest in limiting China’s increasing assertiveness in what both countries consider to be their near abroad. This initial meeting will be a good indicator as to how closely aligned their visions are for this relationship, as well as the tempo and trajectory of future deals. 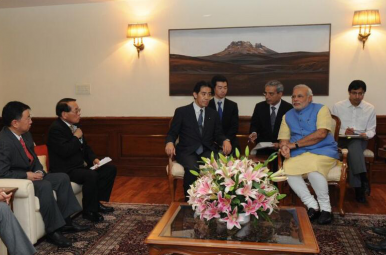 Modi-Abe Summit High on Rhetoric, Lagging in AgreementsSecurity or Investment: Balancing Japan’s Long-Term Foreign PolicyJapan and India to Sign ‘Two-Plus-Two’ Dialogue MechanismJapan’s Summer of DiplomacyUS-Japan Trade Agreement Negotiations: Why Now?